My Mini Bible Sticker Book Series gives you five pocket sized Bible story sticker fun books for your preschool and primary age children. Each of these full colour mini-books tells a well known and well loved Bible story in simple words and on full colour pages that open out into a six 300mm x 210mm (8 inch x 6 inch) double page colour spreads ready to receive the stickers that complete the picture and tell the Bible story. Each full colour picture scene is a delightful background image requiring only three or four well placed stickers from creative little hands to finish the picture. Fifty to sixty easy to read words at the top of each double page spread tell the stage of the Bible story shown in the picture. This Eden value pack gives you 5 of the most loved Bible stories that have captivated children and started them on their way to read and love the Bible all of their lives. All the stickers are on the middle tear-out sheet with helpful numbers to link each sticker to the relevant story page. Also, inside the back cover, are thumbnail-pictures of each completed scene. My Mini Bible Sticker Books make a lovely gift to support your family outreach, children's programme, take home party give-away or take-to-service teaching toy for your children from 4 upwards. Every story is simply told with colour pages and stickers for your preschoolers to complete the picture with all the usual Bible characters - and a few lovable animals and birds too. Popular among toddler groups and childrens clubs, these delightful little booklets offer several mini Bible stories suitable for ages 4-7's these affordable stickers books make wonderful prizes, giveaways, and stocking fillers. 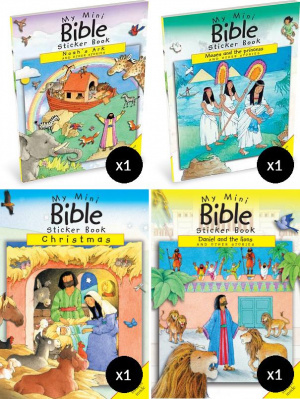 Mini Bible Sticker Books Value 4 Pack was published by Eden bundles in September 2014 and is our 524th best seller. The ISBN for Mini Bible Sticker Books Value 4 Pack is EDENBUNDLE-1527. Be the first to review Mini Bible Sticker Books Value 4 Pack! Got a question? No problem! Just click here to ask us about Mini Bible Sticker Books Value 4 Pack. Popular among toddler groups and childrens clubs, these delightful little booklets offer four mini Bible stories with full-colour stickers to complete the pictures. Inside, children will find traditional and respectful illustrations which bring meaning to the stories with shaped gaps where they must match the stickers to the stories.